December and January are the months when Formula 1 people are most relaxed and access to the drivers and team personnel is at its easiest. This is the time of year when people are prepared to talk about their expectations for the coming season and to make predictions about their own and other's chances. Once the new cars appear and start testing, the pressure begins to build and much of the idle talk dies away. As I write this in the middle of January, the money is all on Ferrari and McLaren, the only variations being whether McLaren will have learned from its 2000 mistakes and will try harder than Ferrari in order to regain the Championship; whether Ferrari will be able to relax, now that it has got rid of its 21-year shadow, and take several more Championships, or are the key people at Ferrari exhausted by the struggle of the last few years and looking for a change or rest? The greatest discussion is about which team will take third place out of Williams, Jordan, Benetton and BAR, whether Jaguar and Prost can sort themselves out, and of course the fates of the new rising stars among the drivers. I shall avoid such dangerous waters and look instead at the factors that may influence the performance of the new cars, primarily tires and technical regulation changes. Many people believe that all motor racing, Formula 1 included, is better sport if there is only one tire supplier involved, rather than having a competitive tire situation muddying the water. However, with Formula 1 becoming a motor industry battlefield, it is inevitable that tire companies want to be involved, using it as part of their marketing strategies. Michelin's return to Formula 1 will have a major affect on this year's results, even if it does not affect the outcome of the Championship fight between McLaren and Ferrari, both of which are on Bridgestones. The most immediate effect is already apparent in testing: speeds have increased due to Bridgestone discarding its voluntary restraint in the use of soft compounds; the results of compound development will undoubtedly outweigh the changes to the regulations aimed at balancing out the increase in tire grip. When Michelin first entered Formula 1 in 1977, they brought with them a new technology new to the formula - radial tire construction - and won the World Championship with Ferrari in their third year. Radials rendered cross-ply tires obsolete. This time however they have no such radical technology (though Michelin's technical base is second to none) and so they may find it much harder to overtake Bridgestone, which has the benefit of a fully up to date database for grooved tires on current tracks. It is difficult to see why Michelin, which cannot test on several of the circuits, should produce a better tire than Bridgestone for any given circuit, this year at least. However, the pressure of competition means that Bridgestone must start to take risks, and Michelin's best chances are when they can push Bridgestone into making a mistake with its choice of compound. Wet tires are somewhat different, the design of them being relevant to other, similarly heavy and powerful series in which Michelin has plenty of experience, and Michelins appears to have the better wet tire at the moment. The tire war will also affect the teams directly, beyond their individual choices of supplier. The intensity of tire development will mean that both Bridgestone and Michelin will end up optimizing their tires for their "most important" team's cars. Bridgestone's choice between Ferrari and McLaren must be hard for them and, whomever they choose, they will be showered with criticism. In the last few seasons, Ferrari has tended to need a harder compound than McLaren with its softer suspension rates. Last year, when this characteristic affected Ferrari's race performance in the middle of the year, they were fortunate that Bridgestone brought harder compounds to the last few races and they were able to wrap up the Championship. Does this indicate that Ferrari and Fiat have more influence with Bridgestone than McLaren and Mercedes? The answer to that question could easily determine the outcome of the 2001 World Championship. 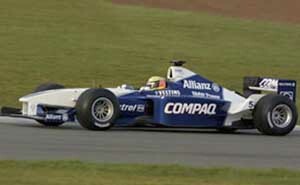 Although Michelin started their test program with Williams, it remains to be seen whether they will continue as their prime team. Michelin can expect a great deal of lobbying by BMW, Renault, and Jaguar (Ford), as well as by the Michelin teams themselves. The Technical Regulation that has provoked the greatest amount of discussion is not even a regulation yet. If traction control is allowed at some point in the year, it is likely to have little effect on the relative performance of the main protagonists. Ever since traction control was banned in 1994, along with many other control systems, it has provoked rumors and accusations that have not reflected well on any of the parties involved - nor on Formula 1 as a whole. The problem is two-fold: what exactly constitutes traction control; and how do you inspect for it in a way that is a hundred percent certain? The motor industry understands traction control as being a system that detects the onset of wheel spin by comparing the speed of the driven wheels with that of the un-driven ones and, either by adjusting engine power, or by braking the driven wheels, or both, prevents wheel spin. Everyone agrees that it is banned. Unfortunately, there is more than one way to skin this particular cat, and the hardware to do so is permitted. To emulate conventional traction control, firstly incipient wheel spin must be detected without feedback from wheel speed sensors, and secondly, torque to the rear wheels must be modulated, without adjusting the fixed characteristics, drive-by-wire throttle system. Monitoring engine speed and ensuring that the rate of change, in any given gear, does not exceed some value that relates to normal acceleration without wheel spin, for instance, can signal incipient wheel spin. Car speed can be calculated by integrating acceleration and corrected for zero-errors of the acceleration sensor by using air speed. I am sure that some of the very clever people working in Formula 1 can think of many other techniques. Modulating engine power does not require moving the throttles; ignition and fuel injection control is quite adequate. In addition, anti-stall software is permitted, as are variable RPM limits, Pit Lane speed limiters, and clutch control during gear changes, any of which might be "tuned" in a way that helped the driver control wheel spin. Control software is offered up to the FIA for inspection to see whether a particular algorithm is passed as acceptable. The line between "engine driveability" and "traction control" is a little fuzzy, and much of the dissent is over whether some teams' ideas about driveability are looked on more favorably than others. Then there are the claims that illegal control software is undetectable, either because it is designed to self-destruct after use, or because it is located in a hidden black box, connected to the CAN network and never found or inspected. The FIA would have to destroy cars to check for them. The inspection task has become so great, with many man-hours spent on going through code, line-by-line that, without the absolute certainty that no-one was benefiting from anything that helped the driver, something had to be done to sort out the problem. The Formula 1 Technical Working Group (TWG), made up of the Team's Technical Directors, proposed that, as electronics were essential for controlling the engine and gearbox, their use should be absolutely free including traction control. No other system on the car would be allowed electronic control. This solution would remove the need for software inspection, saving everyone a lot of effort, and eliminating the rumor mill surrounding traction control. For some reason, not fully explained, the proposal was rejected by the team principals of Ferrari, Prost, Sauber (both using Ferrari engines in 2001) and the other Italian team, Minardi, at the Formula 1 Commission meeting in December. A compromise proposal was put forward by the FIA President, Max Mosley: engine and gearbox electronics would be free, the TWG would propose regulations that ensured nothing else was electronically controlled and a proposed program for the introduction of safety systems relevant to road cars e.g. radar detection of the car ahead in poor visibility conditions; and remote speed limit control for the Pit Lane, yellow flag conditions and to replace the Safety Car. If this could all be agreed by the middle of February, the engine and gearbox electronics would be free from the Spanish GP at the end of April. Discussions are currently under way on this proposal. In order to try and balance the inevitable reduction in lap times due to competition between Bridgestone and Michelin, the teams agreed to a reduction in aerodynamic downforce. This has been implemented by raising the front wing by 50mm (see Figure.1) and curtailing the rear wing elements to a maximum of one lower and three upper elements (see Figure.2). The raising of the front wing will not only reduce downforce substantially - with a further reduction necessary at the rear to maintain the balance - but will also reduce pitch sensitivity. Early reports are a reduction of around 25%, but this will surely be reclaimed as the new cars are developed. In early testing some drivers have claimed that the cars slide around more in the fast corners - good! I would not be surprised to see longer side pods on the new cars, as extending their leading edges forward is known to increase pitch sensitivity as well as increasing downforce. It will be interesting to see whether Adrian Newey's aerodynamic skills, which have endowed the McLaren with non-pitch sensitive characteristics and thus a soft suspension, will remain such a benefit. The lower spring rates make the McLarens easy on its tires and also give the drivers the option of straightening out some chicanes by cutting across the curbs. The remainder of the regulation changes are a result of the continuous quest for greater safety in Formula 1. Though most of the changes will be invisible to an onlooker, they all involve considerable design, R&D and test work by all the constructors, and must inevitably increase the basic weight of the cars. Race engineers have become used, in recent years, to having large amounts of ballast available to trim the weight distribution, and so a tremendous amount of work will have gone into minimizing the weight penalty of these modifications to the new car specifications. The first of these safety measures is the doubling up of the wheel tethers. Since single tethers were introduced two years ago, the incidence of loose wheels has been markedly reduced but not eliminated. No tether can keep a wheel attached to the car under all impact scenarios, but doubling the number of tethers should halve the number of times a wheel comes off, particularly in incidents where a tether is cut by debris. A feature of safety development is that as one problem is fixed, it exposes another. If a driver receives serious or fatal head injuries in an accident, little notice is taken of leg fractures incurred at the same time. The development of cockpit head padding systems has had a major effect on head injuries, but drivers sometimes crack or heavily bruise their legs in heavy impacts, especially their knees, e.g. Frentzen's accident in Canada in 1999, and Herbert's accident in his last Formula 1 race in Malaysia. The outside dimensions of the safety cell part of the monocoque are such that it is now possible to mandate that 25mm of padding must be fitted to the interior side and top surfaces around the driver's legs, to limit their movement and to protect them when they flail about during a hard impact. (See Figure.3). Following a F3000 accident in 1999, in which one car's nose penetrated into the side of the monocoque of another car, fortunately just missing the driver, "armor plate" side panels were specified for Formula 1 cars for 2000. Due to the short notice of the regulation, it was not possible to develop a test specification for these, and so a laminate specification was laid down instead: basically 2mm of Kevlar/epoxy. Formula 1 designers do not like to be told how to make something, they prefer to have a test specification and be able to use all their ingenuity and the resources at their disposal to design the car to meet it at the lowest possible weight (and highest possible cost?). During last year, considerable work was carried out at TRL in England and a test procedure was developed in conjunction with the teams. Haberfeld's accident in F3000 at Barcelona increased the urgency to solve the side penetration problem. This was a repeat of the 1999 accident, but this time the nose of the other car penetrated and badly injured Haberfeld's thigh. The problem is not trivial, as the noses of the cars need to be stiff and strong to absorb frontal impacts, but should be soft to absorb the energy of a T-bone impact, instead of relying on the side panel of the monocoque, which must fail to absorb energy and so allow penetration. Something must crush to absorb the energy of the impact, and it is extremely hard to made a flat side panel strong enough to resist a nose cone. The exact test criteria have not been published at the time of writing, but great progress has been made by the teams in developing panel lay-ups that increase the resistance to penetration many times, even compared to the 2000 specification panels. The standard side impact test, to qualify the side impact absorption structures in the side pods, has been increased from 7m/s to 10m/s, more than doubling the energy to be absorbed in the test. The permitted deceleration of the impactor has been doubled from 10g to 20g, and a new FIA impactor specified that ensures that the load is spread across a suitably located and large enough structure to offer adequate protection, rather than the Benetton style "spikes" of previous years. Diniz's rollover accident at the Nurburgring in 1999, in which the roll over hoop of his Sauber detached, came too late to change the regulations for 2000, although the teams made a voluntary undertaking to double the lateral component of the roll hoop structural test. For 2001 however, all the loads have been increased by factors of: 316% laterally (effectively a 108% increase over the voluntarily agreed loads applied in 2000), 33% longitudinally and 50% vertically (see Figure. 4). So, will 2001 be a memorable season? Hopefully the levels of regulation controversy will be less, though Michelin threatens to challenge the tire groove depth rules. It should be as exciting and close as 2000, as both McLaren and Ferrari are at peaks of competitiveness, and some of the others are catching up, albeit slowly. Motor industry pressure is mounting on the teams they are financially involved in. Jaguar/Ford needs results, BMW is progressing well and has Mercedes firmly in its sights, Renault wants to get back to the front where it used to be, Toyota is coming over the horizon and will undoubtedly be a formidable new adversary, once they pick up speed; and Honda really wants to beat them. There is a satisfactory influx of new driving talent, in the likes of Button and Montoya, who have the hunger of youth and will keep the established drivers well and truly awake. It promises to be a good season ahead, but how it will turn out, I am not foolish or indeed wise enough to predict.